A hard day at work? This photograph was taken when I worked for Brighton Corporation Water Works in about 1965/67. 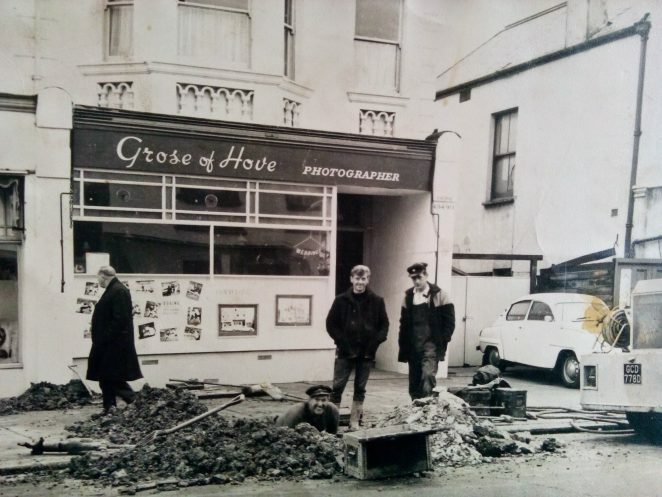 Can anyone recognize the road in Hove? The man in the hole is George Williams, the other man in the cap is George Harding the compressor driver. I’m in the middle working hard with my hands in my pocket. The British workman at his best! Can you share any memories of Brighton Water Works? Please post a comment below. Has anyone got other memories of the Water Works? The depot was based somewhere round North Road I think, it had a big roller door which you could drive into. The man in charge was Vic Inkpen The gangs used to go out sitting on wooden platforms on the back of open back lorries. Of course that would not be allowed now with all the health and safety regulations. Usually I was more safely transported in the back of a van on the floor. It was a great job for seeing different areas each day. Could be 16 Boundary Road, Hove according to my Kellys. I’m sure Dennis is absolutely right. Number 16 Boundary Road, Hove and the properties to the left (north) as we look at the photo, have been replaced since. The newer property at No 16 is now occupied by Gyoury Self and Chantry Vellacott. The pair of houses to the right (south) still survive though. Nos 15 and 14 can clearly be seen on Google Street View. The present-day downpipe, side window and architectural features of No 15 all match those in the old photo. Well done Dennis! Regards, Alan.